Cycling holidays with your family are brilliant! Instead of 'babysitting' your own children while they have all the fun or sending them off somewhere else so you can relax, the whole family enjoys the same experience together. Our first region. Great for little ones because most of the pedalling can take place on the traffic-free and super-flat towpath along the river Mayenne. Off the path the roads wonderfully quiet. The region is full of brilliant places to visit such as the Roman ruins at Jublains and the château at Ste Suzanne. The climate is gentler than further south and every one of our hotels has a swimming pool. Justifiably one of the most popular cycling regions in France. If you have older children or your kids are still in a child seat then the Dordogne is fantastic for families. Our hotels are châteaux surrounded by vineyards, each with the all-important pool. 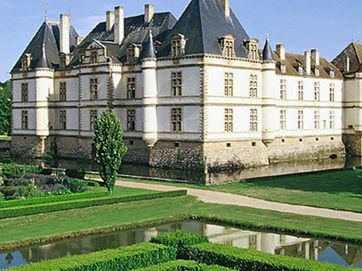 Nearby you'll find superb markets, river swimming, kayaking and medieval spectaculars at the Château de Bridoire. The back roads are quiet but there aren't dedicated cycle routes so you need a bit of road sense. There can be the odd hill so think carefully of little legs before you book. Brilliant riverside cycling along traffic-free routes, pools in most hotels, markets and festivals galore to explore. The food is superb - a great opportunity to get fussy eaters to try a few new things. The Burgundy's biggest selling point for families are the Voie Bleue and Voie Verte cycle paths that offer level pedalling without a car to be seen. Away from the river it can get steeper so plan your routes carefully. The heat and the traffic can be tricky in this region. There are wonderful cycle routes through the hills but not necessarily on dedicated cycle paths. That said, early morning rides to vibrant markets, snacking on roadside peaches or apricots, kayaking from the river mouth at Vaucluse followed by hot, lazy afternoons in the pool make a fabulous holiday for any age. We like to suggest a special one-or two- hotel itinerary for young families, based near Lagnes in a hotel voted among the most family-friendly in southern France, and away from the busiest areas. The Loire à Vélo cycle path is a riverside highway for two wheels between the main attractions. Catch wafts of wild strawberries and gardenia along the traffic-free path, then head into the towns to walk in the footsteps of Richard Lionheart, Elinor of Acquitaine and many others. The cycling is super easy with not a car in sight. Choose your own evening meals if you prefer - if you want pizza one night, have it! Although there are often public pools nearby, many of the hotels in the towns don't have their own swimming facilities. Base yourself at our 'secret' luxury bed and breakfast with pool in Fontenay le Comte and choose your own evening meal from the many restaurants in the old town. Then use the network of flat cycle routes (some on roads, many traffic free) to head towards Coulon - officially one of the prettiest villages in France. Take a day off the bikes and hire a punt to gently explore the 12th-century emerald canals that make this region famous. Perfect for: families looking for a tranquil, easy holiday where you can just relax.